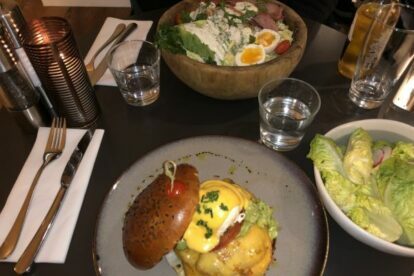 Benedict has become one of my favourite spots for a quick and tasty meal in the middle of the day or for a fancy dinner with friends or in couples. Their place looks bright, full of nice people (not only the waiters, who are remarkable) and friendly atmosphere. They prepare the best eggs in town in different ways: standard, with salmon, with truffles, vegetarian… all the varieties of Benedict eggs you can imagine with the tasty “sause hollandaise” which is so mouth-watering!! They not only do eggs, but beautiful and big salads, meat and other apetizers. The bar is good with cocktails, ice teas which now in summer are so welcome, and they also have a good choice of desserts. It’s not too pricey for that part of Paris. Eggs normally are 15-19 EUR and come with a bowl of salad or french fries, a complete meal normally goes for 20-25 EUR. You will not regret it. It is worth mentioning that as one cannot book in advance, there is often some people waiting, but the assistants take your name and the number of people in your party and soon will find a spot for you. Special tip: it goes faster if you accept to eat at the bar, which is nice when there are only two of you in the group.